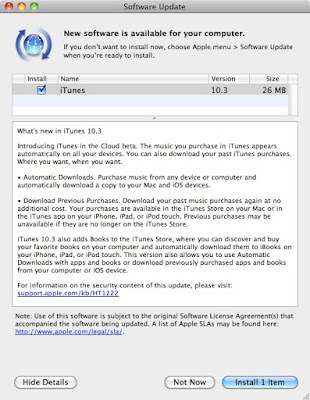 iTunes 10.3, available now for Mac OS X and Windows PC, brings some of the new features unveiled yesterday at WWDC to you now - no waiting until the "fall." 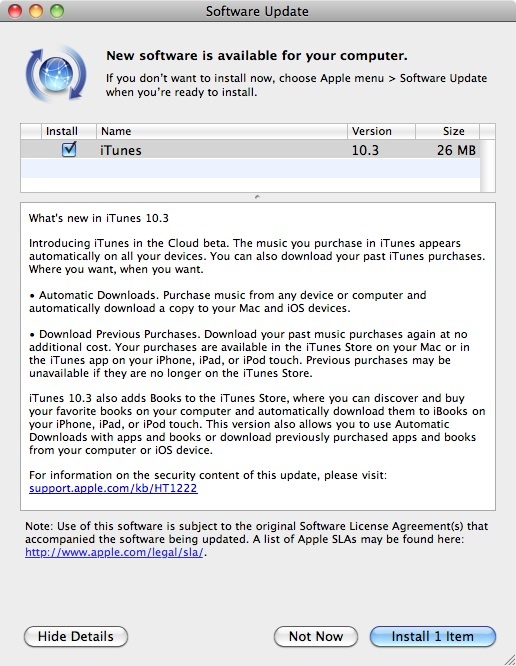 iTunes 10.3 adds Automatic Downloads, Download Previous Purchases, the ability to browse and purchase books for iBooks from iTunes, and our first taste of Apple's new iCloud service which seamlessly syncs music purchases to all of your devices regardless of which device purchased the music. I'm interested in playing with the iCloud sync feature on my iPad, MacBook Pro, and Windows 7 PCs (one at home and one at work). I also want to play around with the Download Previous Purchases feature because somewhere along the way, I upgraded Documents To Go on my iPhone 2G, and since it is running iOS 3.1.2 (yes, it's jailbroken/unlocked so I can use it as an iPod touch) I can't install the current release on it. I'd like to install the older, compatible version again if possible because I did not manually make a backup of the old software. The new features of iCloud, iOS 5, and Mac OS X look really cool, and I can't wait until September to have all of this cool software. At least we can get Mac OS X 10.7 Lion next month. The BETA release was stable, but there has been a problem with the storage function were several items will not be stored.